1958 Simplicity #2425 vintage sewing pattern, misses' half-size two-piece suit, size 20 1/2. 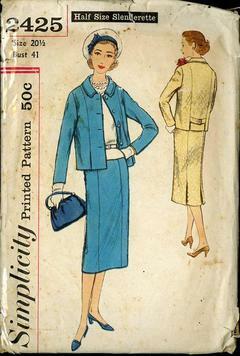 Slim-line suit features skirt with front, back and side panels; pleat at lower edge of side back seams; side zipper closing. Hip-length jacket has front, side and back panels. Missing pc. A & C: SOLD AS-IS for pieces.